Lori Lennard is a third-generation Michigan potato grower whose family farm this year will harvest more than 100 million pounds of tubers destined for the potato-chip fryer and other uses. Lennard Agriculture Co. – which has supplied Detroit-based Better Made Snack Foods with its main raw ingredient for nearly half a century – has burgeoned from 2,400 acres to 6,600 acres since 2002. In the same nine years, the Samaria company headquartered just north of Toledo has grown its payroll from about 10 full-time workers to 35 full-timers, with a proportional increase in the number of part-time jobs, as well. Lennard Ag, which also branched out into growing corn for the ethanol market and other customers, is the kind of expanding business that industry advocates have in mind when they point to Michigan’s agriculture sector as one of the state’s best prospects for jobs creation and entrepreneurship. According to the Michigan Department of Agriculture and Rural Development, about 1,600 food processing firms -- from ice-cream makers to baby food factories to pet food plants -- rely on the produce of Michigan’s 10 million acres of farmland for many of their raw ingredients. MDARD says sugar beets alone drive business for some 1,000 "farm families" in the state, with some 4 million tons of the beets harvested each year. In turn, the Michigan Sugar Co. co-op -- which claims on its website to be the nation’s third-largest sugar maker -- produces 1 billion pounds of sugar a year under the Big Chief and Pioneer labels. And there is no question that ready access to produce has helped Michigan food-processing companies and the suppliers that depend on them -- from trucking to pie-making -- thrive. At Chelsea Milling Co., producer of the economy-priced Jiffy Mix baking supplies, general manager Jack Kennedy says the ability to contract with about 20 area farmers a year to grow a special type of soft winter wheat is a make-it-or-break-it proposition for his company. 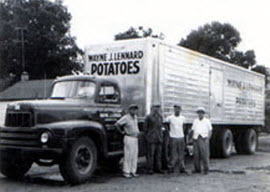 Echoing the freight-cost concerns, Better Made production manager Alan Lee says local access to chip potatoes saves on shipping expenses for the 300,000-plus pounds of spuds it uses each day and allows Better Made to exert the quality control it desires. “You’ve got a history there,” he said. “And they’re in our backyard: If you need more, you can make a phone call and it’s on its way. And on the flip side, said Lori Lennard, repeat business like the sales to Better Made have fueled her company’s growth for more than 50 years. “In the farm world, you can’t grow if the demand isn’t there,” she said.